After several months of gathering up dividends plus a bit of money left over from a purchase in June, I was able to add a share to my position in Abbvie (ABBV), bringing my stake in Abbvie to 3 shares. 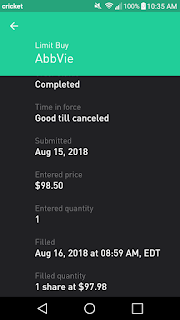 This purchase added $3.84 in forward annual dividend income to my dividend portfolio, bringing the projected forward annual dividend income to $419.32. I'll discuss a few reasons why I decided to add to my position in Abbvie. Abbvie is a global pharmaceutical company that focuses on oncology and immunology. It is the developer and marketer of the blockbuster drug, Humira. Since Abbvie's spinoff from Abbott Laboratories (ABT) in 2013, it has raised its dividend every year without fail. I'm an investor that subscribes to the keep it simple stupid (KISS) motto. It's much easier for a company to succeed in growing its business when there are advantageous long term trends in its industry. With that said, we can very easily observe that a large growth catalyst for the company going forward will be a global population that is growing older, larger in population, and more affluent. As healthcare spending becomes an ever expanding share of the global economy, this will tremendously benefit companies like Abbvie. The healthcare industry is also very inelastic, meaning that people won't be as deterred by a price increase for a medication that is vital to their everyday functioning as they would be if we were talking about a consumer cyclical industry, such as luxury goods. As a result of this, Abbvie is a more defensive pick when compared to a luxury goods company, meaning it likely won't be as negatively impacted by a downturn in the economy as a luxury goods company would be. Having discussed that Abbvie will benefit from massive tailwinds, we can see that the investment research firm CRFA projects Abbvie will grow its earnings at an annual rate 22% over the next 3 years. When considering that Abbvie has grown their earnings at a rate of 21.6% since the spinoff in 2013, this doesn't seem entirely unreasonable. Obviously, the biggest concern and obstacle in achieving this growth is if Abbvie's revenues from other drugs in their promising pipeline don't grow at a rate sufficient enough to more than offset the eventual decline in Humira. Given that Humira biosimilars from Amgen and Mylan are off the US market until 2023, it's reasonable to believe that Humira will remain the top selling drug in the world for at least a couple more years. This gives Abbvie's fantastic management team adequate time to prepare for the eventual drop in revenue from its blockbuster drug, Humira. As Jason Fieber pointed out a few weeks back in his Undervalued Dividend Growth Stock of the Week series, Abbvie's dividend yield is significantly higher than its 5 year average yield. When the dividend yield is well above its 5 year average yield, this can mean one of two things. The company's fundamentals are deteriorating or the market is simply currently undervaluing Abbvie. Given that we've already discussed the strong fundamentals of the company, I don't believe that the dividend yield is well above its 5 year average simply because Abbvie's business is deteriorating. Similar to Jason, I believe the market is undervaluing this strong dividend payer by too strongly focusing on the risks of an investment in Abbvie. Yes, Humira does provide the majority of revenue for Abbvie. I understand the concern in the investor community about this, but it's not as if Abbvie doesn't have time to transition away from its reliance on Humira for the majority of its revenue. Abbvie is projecting for Imbruvica to reach annual sales of $5 billion by 2020. Another recently approved drug to treat endometriosis pain, Orilissa, has the potential to dominate that market and become a billion dollar drug. This doesn't even scratch the surface of other drugs that Abbvie has on the market or in its drug pipeline. I view Abbvie as a quality dividend growth stock that doesn't even have to come close to matching past performance to be a strong long term holding. With the current dividend yield at almost 4% and earnings growth set to be in the double digits, I believe this is a company that is absolutely capable of double digit returns over the long term. 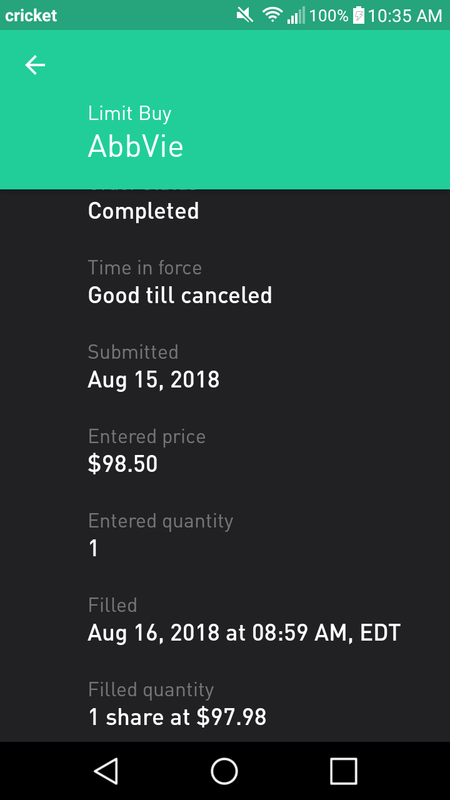 As always, any purchases that I make are unique to my circumstances and my risk tolerance. Although I view it as unlikely that Humira's revenues won't be offset by Abbvie's other drugs such as Imbruvica and Orilissa, it is entirely possible that my investment thesis could prove to be wrong. After all, no investor has a perfect batting average. This is why I advocate a diversified portfolio, and to never invest more than you can afford to lose. Being a pharmaceutical company, there are numerous risks that Abbvie is exposed to including loss of exclusivity/patent expiration, regulatory risks, and legal risks. Please be sure to factor these risks into your investment decision. Please use my recent stock purchases as idea generation, and conduct your own due diligence before making investment decisions. What dividend stock(s) have you recently purchased? What are your thoughts on my recent purchase? A lot of people are buying into this company and I read Fieber's article as well. It is on my watch list and I'll have to do some more digging for the stock. But the yield is nice and they have a really nice patent in their portfolio, that's for sure. Absolutely! I figure they deserve a spot in the portfolio for the time being. I'll have to keep an eye on if my investment thesis holds up, and that they're able to diversify away from relying on Humira so much. In the meantime, I'll be enjoying that nice dividend.